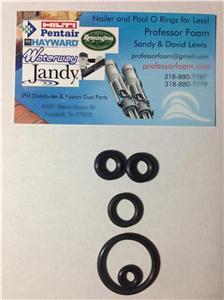 99-03 Aftermarket Powerstroke 7.3 Fuel Drain / Water Sensor O-ring LOWEST COST!! Here is a complete Aftermarket kit to re-seal your 1999-2003 Ford 7.3 Liter Fuel Pressure Regulator Water Sensor. Since the diesel went to Ultra Low Sulfur many Powerstrokes devloped leakes at the fuel filter drain along with the water in fuel sensor and the pressure regulator. The reason is the OEM O Rings shrink and were not made for the new fuel variant, but the problem can be easily and cheaply repaired. Professor Foam o rings are Viton and they have superior chemical and heat resistance. Free economy Shipping, if you want tracking upgrade your shipping to first class package! Shipping times can be from 2 to 20 days, so if you need it faster upgrade the shipping to Priority Mail.